February 1st is the first election day of the year in Louisiana. On that day, the people of Orleans Parish will elect or re-elect candidates for Sheriff, Mayor, City Council, Coroner, and Clerk of Criminal Court. They do things a little differently down in New Orleans than we do in Central Louisiana: For one, the Mayor and the Sheriff, arguably the two most powerful positions in the parish, run on the same ballot. City Councilpersons do not serve staggered terms, which means that, like members of Congress, the entire City Council is up for election. While most Louisiana politicians would likely avoid an Obama endorsement, the president remains remarkably popular in New Orleans. In the 2012 presidential election, Obama received 80.3 percent of the votes in Orleans Parish — a higher percentage of the vote even than that in quintessentially liberal areas like Multnomah County, Ore. (Portland), which went for Obama with 75.6 percent of the vote; and King County, Wash. (Seattle) which managed 68.5 percent for Obama. Only one candidate is a Republican, which means, that on February 1st, the most consequential municipal election in the largest and most important city in Louisiana, a state generally considered to be reliably red, the election will feature only one member of the Grand Old Party. And, considering the Orleans Parish primary is the first of the season and the only election being held that day, it also means, amusingly, there is only one Republican on the ballot in the entire state of Louisiana. (To be sure, there were two Republicans, but one of them, Reid Stone, quickly dropped out. While his name will not appear on the actual ballot, he is still listed on the Louisiana Secretary of State’s website). So, who is this lone Republican? His name is Drew Ward, a military veteran, community organizer, and the great-great-great grandson of the first-elected Republican (known, at the time, as the Free State Party) Governor of Louisiana, James Madison Wells, and he is challenging incumbent City Councilwoman Susan Guidry in District A. Ward is also a direct descendant of Thomas Harris Maddox, who, along with Alexander Fulton, founded the City of Alexandria, Louisiana. (Full disclosure: If Drew’s name sounds familiar to some of my readers, it’s likely because, five years ago, he was a contributor here on CenLamar). With less than a month until the primary, Drew Ward’s chances may seem slim, but if he wins, he would make history as Louisiana’s first openly gay Republican elected official. That’s right: The only Republican candidate on the ballot is openly gay and in a committed relationship. If Drew wins, he’d also become the first openly gay Republican elected official in the American South. A few months ago, when Drew first told me that he was considering a run for New Orleans City Council, I was proud of him for taking the plunge. I knew he had already been working, tirelessly, as an advocate for his neighborhood, and I knew he thinks deeply and creatively about community and economic development. (Most of what he published here on CenLamar was about smart growth planning and making communities more livable and accessible). When he told me he was running as a Republican, however, I told him that, frankly, I thought he was insane. For one, the majority of his district are registered Democrats, and the incumbent, Susan Guidry, enjoys respectable approval numbers. Second, although Drew cleverly presents himself as “Roosevelt Republican,” the truth is that, today, Roosevelt Republicans are better defined as “progressives.” In fact, shortly after President Theodore Roosevelt attempted and failed to “save his party from the crazies,” he created a new political party, the Progressive Party (better known as the “Bull Moose Party”). Eventually, Republicans in New Orleans would figure out that Drew voted for President Obama in 2008 and in 2012; they’d discover that he supports universal health care, that he believes in evolution, that he is a champion of the living wage. And finally, of course, there was the issue of gay rights. Recently, I sat down for an extensive and exclusive interview with Drew Ward, and we had an exhaustive and, I think, insightful conversation on politics, policy, and the future of the City of New Orleans. Lamar: Let’s address the elephant in the room, pardon the pun. The first question most people who have gotten to know you and hear your positions isn’t “Why are you running for City Council?”. The first question is: Why are you running as a Republican? You’re obviously a progressive. Drew: First, thanks for the opportunity to discuss my campaign and my policy positions. Yes, I am a progressive. I believe in progress. I’ve been upfront and honest about that from the very beginning. However, I do not believe that being a progressive and being a Republican are mutually exclusive, in fact just the opposite. In local elections, in particular, party affiliations don’t matter as much, and even though I agree with many of the positions of the Democratic Party, I also believe that Republican Party’s emphasis on entrepreneurship, slim government, and frugal use of taxpayer dollars should resonate with everyone in New Orleans. My district was, until January 1, over 50% Republican, but due to a very purposeful carving away of Republican-leaning neighborhoods by the incumbent during this past year’s redistricting, is now only 30-35%. (Editor’s note: Even prior to changes in the district’s boundaries, Republicans represented only 20% of registered voters in District A. To be sure, the district was previously represented by a Republican, and to his credit, Drew has subsequently acknowledged that he was mistakenly confusing voter turnout numbers with voter registration numbers). I think that if people here actually take the time to hear my message and my ideas for the future of New Orleans, that they’ll open their minds to the idea of voting with their city in mind rather than their party. The only way New Orleans can win going forward is to build a coalition with the goal of truly holistic progress. The first step toward that goal and I suppose the first test for my fellow New Orleanians is whether or not those ideas can attract a coalition of voters from all parties to sanction this call for change by helping win the election. There is another reason I decided to run as a Republican, and it has nothing to do with voter registration numbers: I am a Republican. The opposite of the word “progressive” is “regressive,” and the truth is that the Louisiana Republican Party and the national Republican Party in general have betrayed the fundamental values of the party, values that I’ve always admired. 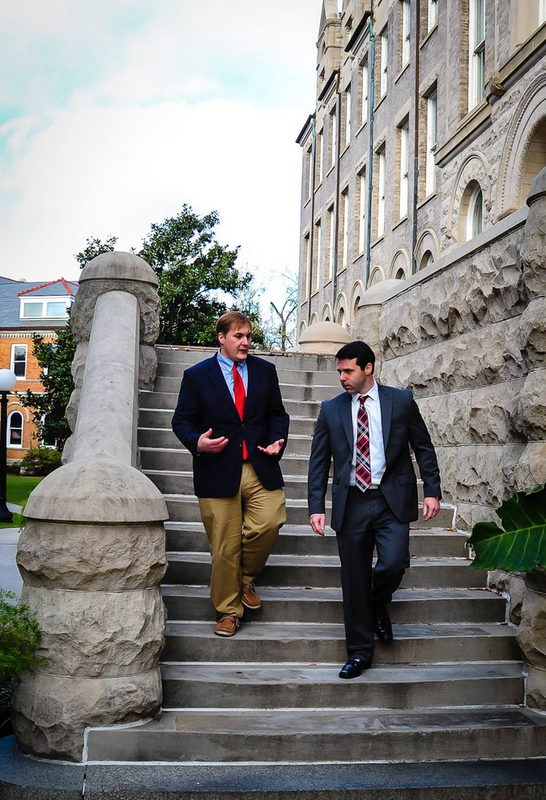 In my own small way, in this short election season, I have the opportunity to advocate for my community and my city and to challenge, directly and personally, the Louisiana Republican political establishment. Because the Republicans in my neighborhood, the Republicans I know in New Orleans, they aren’t homophobic. They aren’t racists. They are decent, educated, and sensible people who believe that local government should be pragmatic and efficient. They want local government to be fair. Like me, they believe in property rights, and they believe in fairness for all people. They aren’t regressive; they are, like me, progressive. I think most people deep down really are. Lamar: But the Republicans in your district probably didn’t vote for Obama twice. Drew: I did. Again, I’ve been upfront about this. I voted for Obama in 2008, because I didn’t want Sarah Palin within viewing distance of our nuclear launch codes. I voted for him again in 2012, because of his record on LGBT rights and because, honestly, Mitt Romney changed his positions constantly. If the Republicans had nominated better candidates, I would have voted Republican. Lamar: How do you reconcile the Republican Party’s position on LGBT issues with your own experience as an openly gay man? Drew: I honestly see their more recent positions on gay rights and their excruciatingly slow acceptance of the reality that equality for all is not only what’s right, but what’s inevitable and here to stay, as them becoming sort of a victim of their own misguided success. Julius Caesar figured out thousands of years ago that the easiest ways to control people is to keep them entertained (i.e. gladiators), or to keep them frightened. It’s basically the lowest common denominator of politics, and it’s been an effective ploy for anyone wishing to whip the public into a fervor whilst deflecting focus from the real issues ever since. It doesn’t take a genius to see which is the easiest sell and which version most people would rather hear. The advantage to this is that so long as you have a bad guy, you can rile up an audience to vote for you without question, usually because you’ve gotten them scared of the alternative which is the magical bad guy (and definitely not themselves). The disadvantage is that you always need a bad guy, and bad guys eventually have expiration dates. Voters will only ignore their realities so long as you can keep them from realizing that the bad guy really isn’t bad and that despite their zealous hatred for him, they’re still as broke and poor as they were before. Think about our history: We’ve gotten some good traction out of our bad guys. Catholics were pretty dependable for nearly a century or more. Jews were good political mashugana for nearly as long themselves. Of course, the same can be said about African-Americans. Communists carried us along for a few otherwise less than stellar decades. Foreigners in general filled the bill for several good years. Muslims somehow kept us with our heads in the sand while Bush and Cheney cashed in, and in the process, nearly destroyed the entire world economy. And back in the early 2000’s when Pat Robertson and company manufactured the gay marriage debate to amp up their ratings and donations, they gave us the enemy du jour. The only problem though was that just as Muslims only lasted a decade, fear of gays started fizzling out as well. The big kicker, though, is that all those issues we’ve been deflecting with this boogie man approach are still there, and they’re still producing the same societal rot today they always have been. People are waking up, mainly they’re waking up broke…still…and that’s the problem. We’re out of bad guys. And that’s a reality now for both parties. This is the age of accessible information, of fact checking, of little kids with Wikipedia on their phones. Misinformation and misdirection are quickly becoming a tactic of the past and a failed one at that. The extremists within the Republican party who fill their bank accounts by pretending to be Christians and getting the faithful frightened almost did too good a job in creating their newest enemy. The party now has to deal with having created the gay scare, cashed in on it for a good ride, and then clung on for dear life as new generations of voters quickly dismissed the whole mess as the asinine ploy it so obviously was. Now, the party has to figure out how to get back to business and be a real promoter of solutions while simultaneously figuring out how to undo the damage they’ve done. Not to mention, this is the party whose grand old progenitor was a gay guy who spent more of his presidential nights in the arms of his first gentleman army beau than in the bed of his first lady during his time in Washington. I guess when it comes down to it, I’ve tried to extend to the members of my party a greater faith in their ability to follow their hearts and grow up and do the right thing eventually regarding equality than most of my fellow Republicans seem currently willing to extend to their many (many!) LGBT brethren. Lamar: Let’s get to specifics. Recently, you were asked to name the three biggest problems facing New Orleans, and you said, “Poverty, poverty, and poverty.” It’s a good soundbite, and, no doubt, it’s true. But how do you meaningfully confront poverty? Drew: You confront poverty like you would cancer. You don’t just snip out the tumor and pretend the cancer never existed in the first place. You don’t get care until you start feeling a bit better and then leave the hospital and hope things magically work themselves out. No, you dig in, you look or every possible hiding place and every little mutant cell you can and you figure out what they are, where they’re coming from, why this is happening, and determine a course of treatment that you KNOW will make sure you not only cure your current ills, but that does as much as you can to ensure that cancer never has a chance to come back ever again. At some point for many, this process involves a decision where the choices come down to an uncomfortable, invasive, and often painful course of treatment versus a more comfortable acceptance that may not be that painful in the near term but that knowingly ends with certain death. You treat poverty in your city not by medicating the symptoms through educational spending, added law enforcement, and all flavor of midnight basketball and low-wage job centric ‘economic development’. You treat poverty by delving in, targeting the root causes of the situation that’d gotten so many into a perpetual cycle of poverty, and you rectify those exact situations. In New Orleans, it’s simple and it’s easily attainable: Adjust the way local government is funded via reforming our property tax collections and revenue systems which will result in a drastic reduction in the cost of living for residents and cost of doing business for employers. We could easily cut $300-$500 off most households’ bills tomorrow if we wanted, and we could drop the current property tax rates from around 150 mills to less than 40 mills — a savings of an additional $1,000-$3,000 per year for most residents and considerably more for small businesses, while still fully funding all arms of local government (something we’re not doing today). The second part of this is to institute a viable local living wage regulation that is based not on some arbitrary number, but instead is tied to the ever-changing cost of living in New Orleans, and also adjusts by rewarding educational attainment, longevity on the job and loyalty to your employer; that removes the incentive for businesses to employ a part-time workforce over full-timers. The trick is to cut costs first so that you can reduce the overhead of employers and then provide them with the needed economic and accounting assistance they’ll need to adjust their business models so that they can move toward paying their employees properly while still remaining profitable. With over a dozen major universities in town, providing that sort of support shouldn’t be much of a challenge. We basically do the right thing by workers and we do the right thing by businesses, but we require that businesses do the right thing for the city they reap their profits from in return. This really is an everybody wins scenario, and that’s a rarity in any situation, politics especially. Lamar: How do you rate Mayor Landrieu’s first term in office? What were his biggest accomplishments, and what were his biggest failures? (Again, full disclosure: I have contributed to Mitch Landrieu’s re-election campaign). Drew: I’d honestly rate his first term as less than stellar, but that’s mostly due to what I see as far too heavy a focus on gauging his view of the city’s health and progress on numbers only. Numbers never tell the whole story, and in New Orleans today, what may look good on paper, what may be getting us attention in the media from people around the nation, doesn’t necessarily translate into success on the streets of our city. City’s the key word here. It’s a place made up of its citizens, and no matter how rosy the numbers and statistics seem for the city itself, if the bulk of citizens themselves are not doing considerably better today than they were four years ago, then no, that first term has not been a success. Conversely though, has it been a failure? No, not at all. It’s been a period filled with unprecedented attention, of countless dollars being spent in earnest toward the end goal of New Orleans one day being the great city it should have always been. But this is also a matter of intentions not necessarily equating to outcomes. Landrieu’s biggest issue seems to be that he’s lost track of why he’s here. I don’t mean politics or an office, what I mean is those 350,000+ New Orleanians he approached four years ago and asked to trust him and help him help them. Whether it’s a matter of having the wrong staffing in place and being clouded behind a filter of yes men, or whether he’s been blinded by ambition toward an end goal with the hope that the details (i.e. the success of the city translating into the success of its citizens too) will fall into place in the end, the Mayor’s disconnect with those he represents has become by far his greatest hindrance and the city’s greatest internal challenge. As to his biggest accomplishment? That video. Well, not so much the video as it’s not really even very well connected to his time in office in the first place, but what that video embodies and the part of that message that has left even the Mayor’s most ardent detractors wont to embrace the message he chose to kick his campaign off with — hope. I can’t seem to find many people at all who truly like the way Mitch is running the city. In fact, most seem to feel he’s building a New Orleans that’s not a legitimate version of it and that he’s seemingly doing it all for people who have moved here since Katrina or who they figure he hopes to attract toward moving here (the proverbial “young professionals”). But at the end of the day, whether from his own actions or even from the actions of citizens despite what they see as his inaction, the one thing Landrieu has become a pro at effectively packaging as a commodity of New Orleans’ rebirth is…hope. Lamar: If you are elected, four years from now, what do you hope to have accomplished? Drew: I’m not foolish enough to think for one second that we can undo the effects of centuries of corruption, graft, nepotism, neglect, and especially apathy in four years. It’s going to take at least two terms to get us on track and likely a decade to start truly reaping the benefits of effective reform. Many things have to come together to move New Orleans forward and to cement our future as one in which prosperity, health, and happiness for our citizens are the order of the day. Some of these can be handled right in the council chamber and could be voted on and enacted tomorrow. Those include such things as eliminating the $100 million or so per year in unnecessary utility fees the council has placed on everyone’s bills each month. A further reform would be to change the way we regulate and deliver utilities at the local level which again could yield a fairly immediate savings for most New Orleanians. Tax reform has a greater potential for savings and such but due to constitutional constraints requires action by the legislature. That would likely take a year at a minimum, but it can happen and can be implemented quickly. The real hard work is going to come in reforming the various wasteful systems and mechanisms of local government itself. From civil service reform, to hiring, to spending, to contacting, etc. There is a LOT of work to do, and it has to all be undertaken in an holistic fashion with the taxpayer’s pocketbooks always at the heart of every decision. That’s all going to take time, but it’s my hope that the hard part of this at the government level would be complete within my first term. That would honestly be only the beginning of a much longer and harder struggle, but it would be the package deal that sets the stage for our city’s and our citizens’ truly successful future. If I am lucky enough to get elected, we’ll have a lot to do to lay the groundwork for New Orleans’ future. And if I am even luckier to be elected for a second term, it’ll be that next four years that will hold the greatest promise and the hardest work we’ll ever undertake as a city and as a community — that of translating the progress, savings, reform, and efficiencies we’ll have achieved within the government into an effective change to every facet of life and living in our city so that the benefit reaches every New Orleanian at every level in every neighborhood and does so for years and decades to come. I’m not surprised. I’ve always noticed that Louisiana votes blue locally, and red nationally. I never understood that combo, but it’s interesting nevertheless.